This weekend after a long break the MCE British Superbike championship returns to Snetterton in Norfolk for the fourth-round of the series. 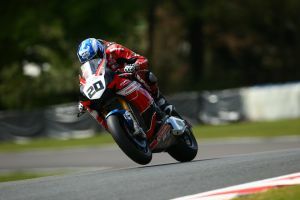 Honda Racing's Jenny Tinmouth and Jason O'Halloran will be reunited with Dan Linfoot after he broke his wrist at Brands Hatch and subsequently missed the last few rounds. The trio is in a confident mood ahead of the two races at the weekend. During an official test at the Norfolk circuit a few weeks ago, which saw Linfoot back on-board the Honda CBR1000RR Fireblade, for the first time since his injury, all three riders enjoyed a successful test. "I'm looking forward to getting back to racing this weekend; sitting on the grid at Donington feels like a very long time ago now. It's been a difficult period with the injury to my wrist, but since the test at Snetterton my life has been back to normal a bit and I'm back to my training. Missing a couple of the races isn't ideal but the season starts again for me now and if I can get two strong results this weekend I'll be happy. The wrist is a lot better now and I have a lot more movement and strength in it, I've ridden quite a lot on my road bike in my recovery and it's feeling good and I'm ready!" "Obviously I'm really looking forward to the weekend and getting back out on my Fireblade. It's been nice to have a break, but I'm chomping at the bit to get back out there. We took some good data from the test there a few weeks ago and have a few things to try this weekend, so looking forward to working on that. It's still all working progress, but we're getting there and I can't wait to get out there now!" "I'm feeling really good ahead of the weekend; we had a positive two-day test at Snetterton a few weeks back, which for me was exactly what I needed. The guys changed my position on the bike and it feels a lot better. We also worked through a number of settings, so we're already in a good place for Friday's free practice. The pace during the test was quick, so in practice we'll work on closing the gap with the top runners. I'm confident we can be in the top-five group and in a strong place. It's been a long break and I can't wait to get racing again!"